The Goa Carnival is one of the most awaited events of the beach paradise. It is a non-stop 3-day and night festival of joy, dance, music and merriment. The time when the air in Goa is full of energy and fun- 'n' -frolic. The Carnival at Goa is held in mid February before the Lenten fast of the Christians. The event features lively processions, floats, the strumming of guitars, graceful dances. The carnival concludes with the famous red-and-black dance held by the Club National in Panajim on the final day. The Carnival also brings along large lavish food parties, where people eat meat to their hearts content. The Carnival is the most sort out festival of Goa, which is flocked by loads of tourists from all around the world. It is believed that the Goa Carnival was introduced by the early rulers as a rowdy celebration. It was earlier celebrated by throwing flour, eggs, oranges, lemons, mud, sand-filled gloves along with dirty water at the passersby. Perhaps this was done to discard the old and the dirty before the Lenten fast. People munched lavish food and distributed cakes and pastries. As years passed this rowdy celebration was converted into the happiness spreading Goa Carnival. As per traditions even today King of Chaos is elected, called King "Momo" who takes care of the 3 day festivities. It is he who orders his subjects to party on the first day of the Carnival. Basically the Carnival is a Christian event since it is celebrated before the Lenten fast. 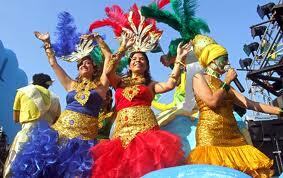 But today the Goa Carnival has no religious undertones and is seen as a major visitor pulling event of Goa.